Scott is definitely at home in Guelph and especially on the east end, which is, in part, why we strive to have a community focused vet hospital. Born and raised in the countryside east of Rockwood meant that most of the amenities were located in Guelph. As a kid growing up, the only thing on Eastview Road was the landfill, and Scott is thrilled that the Eastview area is now known as a growing family community with new businesses and, of course, home to some excellent new sports fields. On that note, Guelph is where Scott played hockey, rep baseball, and ran track growing up so we will always be looking for ways to give back to the Guelph sports community. He is a graduate of John F Ross High School, the University of Guelph and the Ontario Veterinary College so you don’t get more local ownership than that! In fact, it is no secret that Scott also owns Woodlawn Veterinary Hospital and he will share time between both in order to continue to foster a team approach to modern veterinary care. 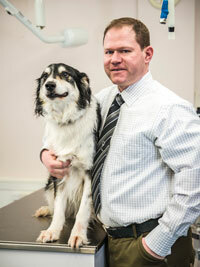 Scott’s career started at a very busy mixed animal practice in Alberta. He lived his dream of becoming a dairy veterinarian and spent most of those eight years practicing bovine medicine and surgery on both dairy and beef farms. As a companion animal veterinarian, he is often described as being down to earth, having a lot of common sense and having good rapport with owners. He is quick to point out that these attributes came in large part from his time as a large animal practitioner which ultimately moulded him into the vet he is today. At home Scott shares his time with his wife Sarah (also born and raised in the Guelph area and a graduate of the University of Guelph), daughters Julia and Emily and, of course, their pets full of personality. Juno is a feisty calico cat from a dairy farm in Alberta who definitely lets her preferences be known. Other family pets include S’more the guinea pig and Julia’s mouse. Dr. Gardiner and his border collie, Thai. Originally from Brighton Ontario, Dr. Cirinna is proud to call Guelph home for the last 12 years. Having completed her undergraduate degree in 2005 and receiving her DVM from the Ontario Veterinary College in 2009 she has come to consider herself a Guelphite. Mel has always been impressed with the sense of community in Guelph and was thrilled when she received the opportunity to practice veterinary medicine here. One of the most exciting aspects of veterinary medicine for Dr. Cirinna is the opportunity to work with clients to diagnosis and treat their pets. Mel strives to provide clients with the knowledge they need to make informed decisions about their pets’ health. It is important to Mel that clients feel that they are a member of the team rather than just another case. Although all aspects of veterinary medicine hold interest for Dr. Cirinna, Mel is especially interested in weight management and senior pet health. She also has a special interest in surgery. Mel realizes that every client and patient present an individual situation and strives to tailor a treatment or management plan that will fit for you to help your pets live longer, healthier and more comfortable lives as they age. Mel lives here in Guelph with her husband and their two daughters. The family shares their house with a Labrador retriever (Charlie) and cat (Rembrandt). And don’t forget the Chihuahua (Leo) who was boarding for a short while and still lives there 2 years later. In this busy household getting out into the community they love is a must. Dr. Cirinna and her family spend weekends visiting local parks, hiking trails and local festivals. They enjoy shopping every year for the Guelph Adopt-A-Family Christmas drive as well as participating in the local YMCA events. When not at work or with her family, Mel can be found enjoying a walk with the dogs or training at the gym for a Spartan, Tough Mudder or cross-country race.